Belcam has crafted a perfect bath experience for you with its Belcam Dee-lish 3 in1 Body Wash, Bubble Bath and Shampoo! 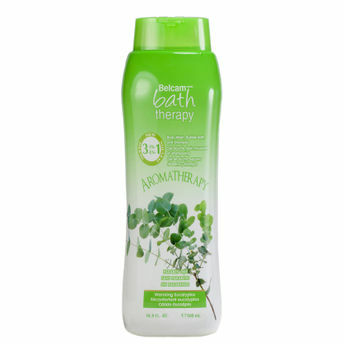 It's a shampoo for clean invigorated hair, a body wash for intensely clean skin and a bubble bath for a relaxing soak. Warming Eucalyptus has the fresh scent of aromatic essential oils that will enhance your mood. It provides a refreshing spa-like experience at home. This product is a convenient and economical three-in-one body wash, bubble bath and shampoo. Why carry and store three bottles when one is enough to solve all your bathing needs? Buy smart, smell good and feel fresh! Heard of eucalyptus? If you have, then you are like most others. Most of us have heard of the plant, we probably even have it growing in our backyards. But thatA s not a big deal, unless of course if we know of the benefits of the plant A " because a few of them are unbelievable. Eucalyptus is largely used for first-aid purposes due to its vast remedial and healing properties. It can be used in relaxing or therapeutic showers. Aromatherapy when split into two words means Aroma and Therapy and aromatic substances/materials are used as a therapy for the human body. When you use Eucalyptus on your hair, you protect your scalp from itching. Using Eucalyptus on your head leads to follicle stimulation which in the end leads to healthy hair. Explore the entire range of Bath Time available on Nykaa. Shop more Belcam products here.You can browse through the complete world of Belcam Bath Time .